ZiP™ is a new Modular Weapons System, delivering amazing features with performance and upgradeability. The Future of Fun™ and a great day at the range. Camping, hiking, exploring the world - ZiP™ adapts to any mission. The next generation of future weapons in a light, compact form factor. Simple in design, ZiP™ is a new Modular Weapons System, delivering amazing features with performance and upgradeability. With a near unlimited service life - you will experience The Future of Fun™ and a great day at the range. Camping, hiking, exploring the world - ZiP™ adapts to any mission. ZiP™ was developed in a new division of USFA. Demand in the market is high for a fun .22 pistol which brings new engineering solutions to reduce cost and provide safety and a great day at the range where you can shoot all day without breaking the budget of cost minded consumers. ZiP™ is a “Pure” blowback design. Meant to function with a wide range of common ammunition and a few specialty .22 rounds as well. ZiP™ has no slide, so it has no "over the hand travel" like most other guns. And zero possibility of slide bite. Also, ZiP™ has no moving parts on the top so it allows for a very unique system of rails and adaptability. ZiPPic™, ZiPNite™ (Glock style sight provisions), and ZiPSBR™ (Approved ATF Form 1 for legal use). 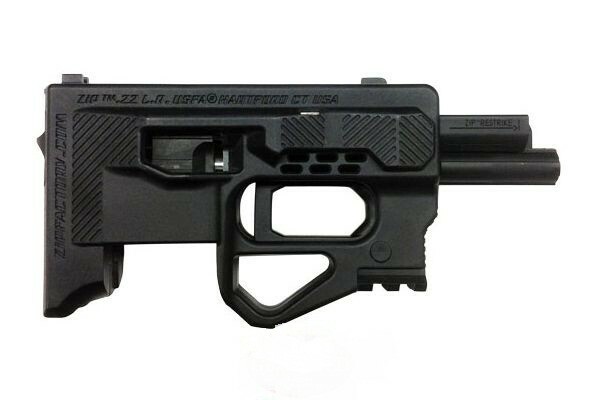 The ZiP-Action™ is a simplified straight pull trigger (no winding trigger bar around a magazine well. . .) striker-fired action with 5 safeties. The "reset" length is among the shortest in industry (about 1/10 of an inch) and the trigger pull after reset is the same shot to shot.